German Christmas markets are a kaleidoscope of colors and lights... and that's a good thing in the dark days of December. These are street markets that are usually held in town squares and spill over into adjacent pedestrian zones. But the tradition of Christmas markets in Germanic speaking parts of Europe seems to go back to the Middle Ages. When Do German Christmas Markets Open? Starting about the last week of November, you'll find the Market Squares in many German cities transformed. Lights twinkle, and the aroma of mulled wine, roasted chestnuts and savory grilled German sausages fills the air. There is music and traditional dancing. Open air stalls sell everything you can imagine related to traditional German Christmas celebrations. 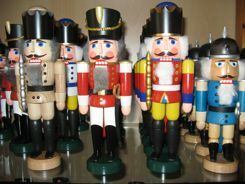 All of those are to buy, but you may even find the town decorated with town-size versions of all of these! Each city or town has it's own traditions and specialties. There is so much to choose from. Frankfurt is a good city to fly into, and it has one of the oldest German Christmas Markets. It started in 1393. On Romerberg Square, Paulsplatz and Mainkai Quay you'll find hundreds of stalls selling arts, crafts and seasonal food and drink. Munich is another city you can fly into. You can probably find everything you want on the main square at Marienplatz. You can also visit the market in Schwabing. Artists and artisans have held a Christmas Market here going back 1,200 years. Berlin is Germany's capital again. It looks like a fairytale land at Christmas with around 60 traditional Christmas markets! There are endless shopping opportunities, concerts, and lots of food and drink. Dresden has a thriving Christmas Market tradition that dates back to 1434. They bake an enormous "Stollen" cake... four tons of cake! It is the centerpiece of a grand parade, and at the end, it is cut and ceremoniously handed around. In the Romantic Road town of Rothenberg ob der Tauber, you'll find an enchanted Christmas wonderland. There are Christmas stores and a Christmas Museum open in town all year long in case you can't get there at Christmas. Because this is such a cute little town, it's one of the prettiest German Christmas Markets. Kids have fun in the "Gingerbread House". Large cities have large markets, but don't overlook the smaller ones, they are just as magical. No matter which you choose, you can get away from mass marketed toys and decorations. 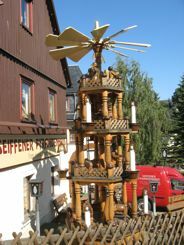 If you want to see where many of those Christmas decorations are made, visit the little town of Seiffen. We visited in the summer, but how magical it would be in the winter! If you want to go to one of the German Christmas Markets, remember it's going to be cold, so take plenty of warm clothes. But don't let the cold stop you! --Days are short, but that just makes the twinkling lights more magical. --Nights are crisp, but that makes the mulled wine and traditional foods more appealing. You should make reservations well in advance... especially in the smaller towns. Be prepared for crowds, but remember, everyone will be festive and you'll have fun.